Apparently I've been living under a rock. I somehow missed the food blog revolution. About 2 months ago I was searching online for a tea house that a girlfriend and I could incorporate into our girls day out. I was lucky enough to stumble on the Tasting Spoons blog where Carolyn provided a wonderful write up of a tea house. I quickly realized the site had much much more! Recipes. Stories. Beautiful photos. Food tips and tricks. I bookmarked the site and found myself coming back daily to see what was new in Carolyn's kitchen. Then I made another very important discovery....The Blog Roll. This was a link to so many other bloggers and endless options to access more about food, pictures and recipes to salivate over. I feel like I literally opened Pandoras box....but in a good way! So thanks Carolyn! 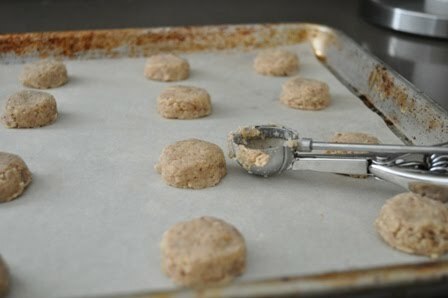 One of the coolest discoveries in my new adventures in blogging was the discovery of online baking and cooking groups. The minute i came across Sweet Melissa Sundays I knew I wanted to be a part of this. So it's with great excitement that I present my first SMS post....Pecan Shortbreads. Though I love cookies, I have never made a shortbread before. I was pleased to find that I already had all the ingredients. This cookie was so simple to make and tasty! The recipe called for finely chopped pecans. Upon suggestion of another SMS baker I toasted my pecans in the oven for 10 minutes prior to whizzing them around a few turns in the food processor. I like a really fine chop on nuts in cookie recipes. The dough comes together in a food processor as well...a nice change from the stand mixer. 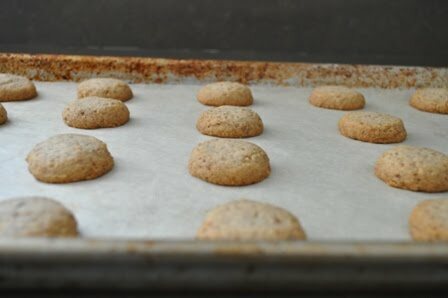 I used a small cookie scoop and was able to fit 20 cookies on a sheet. The recipe produced exactly 40 cookies. I patted each cookie down down a bit to get a flatter top. 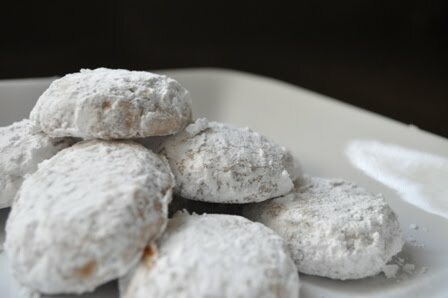 Once the cookies were completely cooled I rolled them in powdered sugar. You almost can't be too generous with the powdered sugar. The butter and oil from the nuts are quick to soak in the sugary white coating. These are delicate cookies with a sandy crumble that melts in your mouth. The recipe called for unsalted butter, however I only had salted in the house. I didn't adjust the salt to accomodate but wish I had. Generally I am a fan of a little extra pinch of salt in my cookies but this is apparently not one where it works. They are still very tasty and got the thumbs up from my official cookie taster pal who was kind enough to take half the cookies off my hands. They pair well with milk (or coffee I would imagine) and make a very nice breakfast as I tested out this morning. For the more check out Lara's blog. Your cookies look great!!! And welcome to the group. Be careful with food blogging...it's very additive and I spend way too much time online looking at pretty food photos! LOL!!! Thanks Rosy & Mara! I'm looking foward to the future recipes. Still trying to figure out whose going to eat all this stuff!